Since opening in 1979, Driftwood Surf Shop has been family owned and operated. The shop originally started out as a sort of art gallery and beach shop hybrid. When Pete took over the ownership in the early 90’s, Driftwood Surf Shop was transformed into a full surf shop. As you walk in, the room is filled with the cool Atlantic breeze and laid back surf music. Surfboards and paddleboards are suspended from the ceiling and the walls are lined with merchandise. Steve, the current manager of Driftwood Surf Shop, was manning the front desk first thing in the morning. After giving us a quick rundown on the shop, he talked about the shop’s focus on providing a high level of service to the community. And it’s that product line that makes Driftwood Surf Shop unique. Aside from plenty of surf and skate gear, Driftwood Surf Shop offers a wide selection of clothing, bathing suits, shoes, sunglasses and lots more! There are also tons of unique Driftwood Surf Shop apparel. But since this is a surf shop, there is an emphasis on surfing and other water sports. Steve mentioned another way in which Driftwood Surf Shop is able to showcase its customer service and set itself apart from other shops. 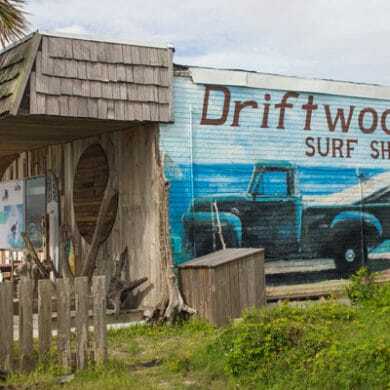 Come see why Driftwood Surf Shop has been the local’s choice on Amelia Island for decades. Driftwood Surf Shop is located directly across the street from Seaside Amelia Inn at 31 S Fletcher Ave, Fernandina Beach, FL 32034. For more information, visit the Driftwood Surf Shop website or call (904) 321-2188.